Chores are never going to make you jump for joy. But there are ways you can make everyday cleaning and maintenance less of a pain—you just need to find the right hacks. 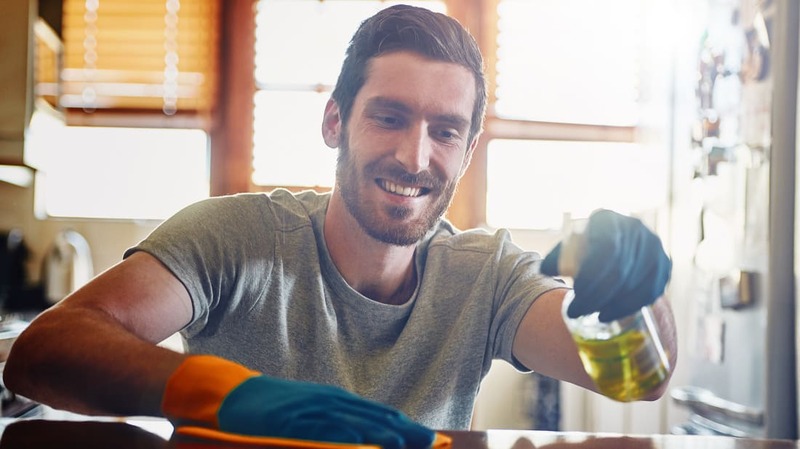 From simple household items that double as top-notch cleaning supplies to the easiest way you’ll ever get wrinkles out of a shirt, here are eight life hacks to make household chores easier. 1. ICE CUBES IN THE DRYER GET OUT WRINKLES. Ditch the iron or handheld steamer and just grab some ice if you want to get wrinkles out of a shirt or slacks. Put two or three ice cubes in the dryer along with one or two pieces of clothing and place it on the hottest setting. The ice melts and turns to steam, getting the wrinkles out. This trick isn’t as effective with heavier clothing, but it’s a miracle on lighter fabrics. The best part is that you don’t have to set the dryer for longer than 10 minutes or so for it to work. 2. EMBRACE VINEGAR FOR LOTS OF TASKS. Your kitchen’s favorite acid can be a superstar on cleaning day. Do you have a collection of cloudy drinking glasses that just won’t come clean? Don’t waste your time scrubbing and scrubbing with traditional soap. A little white vinegar will help get those hard water stains out, along with a whole bunch of other unsightly stains around your home. For glasses, you can soak them in diluted white vinegar or simply dunk a rag in your vinegar and clean as usual. This trick will also do wonders for your coffee carafe and dirty faucets. If you haven’t cleaned your showerhead in a while, put vinegar in a plastic bag and wrap it tight around the head overnight. In the morning, remove the bag and wipe it down to get it to sparkle. That’s not even close to the end of vinegar’s powers. For dirty blinds, put some vinegar into a bowl and put your hand into an old sock. Dip your fingers into the vinegar and wipe those blinds down with the sock. It’s far easier than taking the entire set of blinds down to clean them, and it does a much better job. 3. PICK UP BROKEN GLASS WITH BREAD. When you inevitably drop a glass and hear it shatter on the floor, you know you’ve got to spring into action to ensure you get every last shard. While picking up the big pieces is easy enough, the small ones can really be a pain. The hack? Put a little bit of water on a piece of bread to make it a bit damp and press it on the floor where the remaining fragments are. The glass will embed in the bread without the danger of cutting your fingers or feet in the process. It’s much easier than trying to sweep up every last fragment, and you’ll likely be able to catch those tiny bits that are otherwise invisible to the naked eye. 4. CLEAN A FOGGY MIRROR WITH SHAVING CREAM. This is a bit of a two-for-one cleaning tip. If you apply traditional shaving cream to your mirror and wipe it down with a paper towel or rag, not only will you rid the mirror of smudges and streaks, but it’ll also keep it from fogging up during a shower for a few weeks. This trick is also useful for cleaning your glasses and car windows. 5. CLEAN YOUR MICROWAVE WITH LEMON. Instead of scrubbing, scraping, and scouring away at a splattered microwave mess, you can get a better clean with the help of a lemon. Simply squeeze juice from a lemon into about half a cup of water and drop the remaining lemon in. Put the mixture into the microwave for around three minutes—basically long enough to come to a boil. The mixture, now steamed, will fill your microwave. Once you let it sit for five minutes, you can open the microwave, remove the bowl, and take a cleaning rag or paper towel to the inside. Any spilled gunk will come off easily, and the lemon and steam will help any lingering odors. 6. RINSE OUT YOUR BLENDER IN SECONDS. Instead of disassembling your blender and cleaning those sharp blades by hand, there’s a simple hack that’ll save you time, effort, and a headache. Just fill your blender halfway with hot water, throw in some dish soap, secure the lid, and turn it on. The hot water and dish soap will remove the stubborn residue around the blades, and you’ll be able to just rinse it all out when it’s done. 7. NEUTRALIZE ODORS WITH A FEW SIMPLE INGREDIENTS. Instead of needlessly scrubbing your kitchen from floor to ceiling or spraying air-fresheners every time you cook a little salmon, there are simple solutions to get rid of unwanted cooking smells. One method is to simmer a pot of half water, half vinegar on the stove. The other is to boil a pot of water with orange and lemon peels thrown in right after you cook. This is a quick and cheap way to get rid of unwanted aromas that linger for days even after you crack a window. 8. CLEAN YOUR BATHTUB WITH GRAPEFRUIT. Ditch the harsh, expensive chemicals and embrace a more organic way to clean your tub. First, turn the water on and get your tub wet from end to end. Then, simply cut a grapefruit in half, sprinkle a generous amount of salt on the exposed fruit, and begin scrubbing. The combination of the citrus fruit and salt removes soap stains and other assorted messes while leaving a pleasant smell behind. The same technique can be used on sinks, faucets, and fixtures as well. If you’re looking to switch to easier, more natural cleaning solutions, the grapefruit is a safe bet. With the right tips and tricks, any household chore can be made a little easier. Luckily, finding the right credit card is already easy. Discover Card automatically matches the cash back you earn, dollar for dollar, at the end of your first year. Visit Discover to learn more.